Hersal Eugene Gibbs age 88 of Falmouth passed away on September 10, 2013 at Lakeview Lutheran Manor in Cadillac. 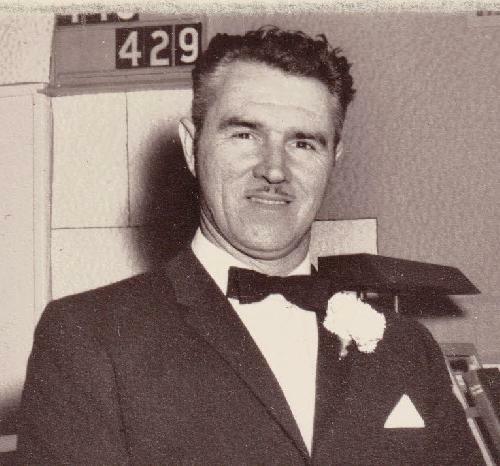 He was born on October 1, 1924 at Marion to Hersal William & Beulah Mae (Gay) Gibbs. He married Helen Ann Hurtik on August 31, 1946 in Phenix City, Alabama. Gene had graduated from the Auburn Heights High School and had completed a one year course for the VA on farming techniques at Cadillac. At the young age of 16 he began his career in mason work in Pontiac and continued doing the stone mason job for over 50 years. He had also farmed part time raising pigs and working with dairy cattle. For a period he was foreman at Kysor Heating in Cadillac. For over 21 years he and his wife sold Christmas trees in the south. He retired at the age 0f 62, but continued to do construction work well into his 70’s. He had been a long time member of the McBain Presbyterian Church and presently was attending the Clam River Chapel in Falmouth. Gene had sung for many years at funerals, weddings and other occasions. He had sung on the Traverse City Barber Shoppers Chorus for over thirty three years. He had also sung at the Willard House in Lake City and the Marina Restaurant in Cadillac. He was one of the first to purchase stock in the Missaukee Golf Course and enjoyed playing golf, fishing in Canada and traveling to Alaska and many other places. Gene had served in the US Army during World War II and had served in the American Campaign and in the European African Middle Eastern Campaign where he had earned the Victory Medal, 3 Bronze stars, Good conduct, Combat Infantryman Badge, American and Middle Eastern Campaign Medals. Gene is survived by his wife, Helen A. Gibbs of Falmouth and children, Marlene (Dean) Jenema of Falmouth, Lonnie (Ginny) Gibbs of Jonesborough , Georgia, Jennie (Denny) Pruetz of Cadillac, and Jill (Pat) Laurin of Great Falls, Montana. Preceded in death by his parents, son Chris Alan Gibbs and In laws, June Gibbs, Barb Hurtik, and Louis Hurtik Jr.